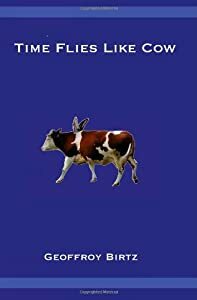 This is a copy of Time Flies Like Cow by Geoffroy Birtz, an often humorous prose following the narrator on a day out, driving around completing errands. Prompted by what is observed, the narrator reflects on the nature of various concepts. The ponderings cover a myriad of subjects, from the economy to education, from quantum physics to social concerns. Each one approached with a unique and insightful perspective. 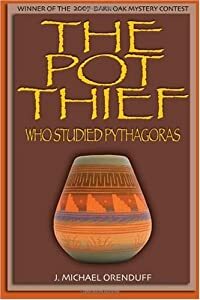 This signed book, The Pot Thief: Who Studied Pythagoras by J. Michael Orenduff, is the 2007 winner of the Dark Oak mystery contest. When a shady character offers him $25,000 to steal a thousand-year-old pot from the Valle del Rio Museum, Hubert Schuze knows he should turn it down. His pot digging may be illegal, but it s a big step from that to robbery. But he figures it can t hurt just to visit the museum and assay his chances. He figured wrong. After deciding the museum is impregnable, he returns to his shop to find a BLM agent who accuses him of stealing the rare pot. Theft charges escalate to murder, and Hubert must solve the crime to clear himself. His powerful deductive skills and weak nerves are put to the test as he creates a hoax to get the pot out of the museum and solves both the first murder and a second one whose victim turns out to be the person Schuze thought was murdered to begin with! This entry was posted in Authors and tagged giveaway on December 1, 2010 by Mario Lurig. Thanks for the great book offerings in this giveaway.